This weeks’ subject was (in a way) a continuation of the concept of integrated technology for our textiles, except in the unusual and ever expanding form of Soft Robotics. Our Global Instructor was Professor Lily Chambers, who gave us a wonderful lecture of the history, nature and development of soft robotic ideas in her own research (FILOSE for Svenning: A Flow Sensing Bioinspired Robots) as well as many other examples from studies and universities across the globe such as MIT, Harvard, Rhine-Waal University of Applied Sciences and more. The class will focus on the study of a specific field in robotics, the soft robotics. Unlike rigid robots we are mostly used to, soft bodied robots have similarities and performance characteristics similar to living organisms or the human body. Soft-robotics are based in Bio-inspired design or biomimicry and have applications in wearables, rehabilitation prosthetics, surgical robots, rescuing and others. We will focus on the fabrication of soft actuators, sensors and grippers using novel materials, artificial muscles and performative locomotion design. We began this assignment by 3D printing some of the molds for the soft gripper actuators (intermediate level). This included setting up the 3D printers, printing our pieces and then cleaning them of any errors or dust. We had several different moulds and each time we used the vacuum to removed the bubbles from the mixture before pouring it into the mould. Here is the first X mold, the the Y mold. Then allowing the molds to dry for 4+ hours, before taking the pieces out. During the silicone making process, we also aimed to create a flat level sheet of silicone which would be the base of the soft gripper actuator, to complete the design, ready to test with air. The dried pieces , the front & back/upper & lower, were then stuck together… using more silicone as the glue of course! Here are some of the result of the silicone soft actuator grippers that were created in above process…Also so some of our tests! So…We had a few hiccups a long the way! Mainly to do with the surfaces which we dried our flat pieces on were not level. This created different thicknesses which cause the shapes not to bend evenly. 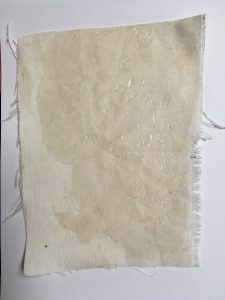 As I am interested in the bioplastic textile compounds as a subject to develop, I also took the opportunity to see what silicone in fabric looks and feels like. This led me to sketch out some ideas based on my research of experiments show in videos online. The following tests were unsuccessful and broke, but I also tried to make a cone in the silicone-fabric and sewed wood sticks into it. This made a stiff section in some areas and left the other areas bendable. The idea is to imagine it as an air-tight actuator, than can bend and flex. I have use needles for medicine injections to create paths or holes through sheets of scrap silicone. These act as veins and in some cases, pockets of space which can be inflated with an air pump. It is interesting to see how fine a line you can get in the silicone and still push air through it. I used scraps of pieces from the leftover flat bases as well as what had been left in our mixing pots aka plastic bottles! As a group, we also did some tests using fabric in silicone with a layer of silicone stick on top and leaving an air bubble in the centre to act as the form which would expand when blowing air inside. I think this was the most successful of the silicone we made in terms of it not having blemishes and being an even surface. Here is a list of what we have achieved over this project. We have printed out 3D models to pour silicone into them to mold them into actuators. We have made latex and compared the properties to silicone. We have used a pump powered by an arduino board and sketch, attached the pump to a pipe and then the medical needle, then inserted this into our various actuators and test grippers. We have tested our molds, looked at what went wrong and tried to improve on the design. How do the actuators work? What are the applications for textiles…? and maybe my projects in the future…?